In 2010, using the Kindle app on the iPad sold me on ebooks. Amazon needs never fear (and I'm certain they don't) that the iPad is taking away sales of the Kindle. In fact, it's probably the opposite. I enjoyed reading ebooks so much on the iPad that I wanted to get a dedicated Kindle. So, in January I bought a Kindle 3 (see review here). I knew I would enjoy reading books on the Kindle based upon my iPad experience, but that wasn't the primary reason I bought the Kindle 3. I teach a good bit in both the classroom and at church. The iPad was wonderful because in one device I could have my presentation slides, textbook and course notes. The problem was that if I had the iPad connected to a projector, I didn't have easy access to these other materials. I needed a second screen—either that or go back to lugging books and notebooks with me again. So a few months back, I bought a Kindle 3 and absolutely loved it. It did almost everything I needed it to do as a companion to the iPad (see my post about using the Kindle and iPad together), and it also brought another advantage to the table: the Kindle 3 is clearly the best device for straight reading of ebooks. I had no idea how much I would enjoy simply reading on the Kindle. However, I had one small complaint about the Kindle 3: it's small 6" screen. On a near daily basis, I access PDF articles. I found that even though the Kindle 3 would read PDFs natively, it was nearly impossible to read the print on the small screen. You can zoom in, but this is really not a practical way to read most articles. Amazon offers a free conversion service, and I was able to use this with some articles. However, this didn't work as cleanly with directly scanned-in articles, and with some articles, I need to reference original page numbers. So, I'd been eyeing the Kindle DX—which has a much larger display—for a while, when a couple of weeks ago, Amazon offered a significant one-day discount on the device. I placed the order and received it the very next day. After having it for only a few days, I quickly knew its strengths and unfortunately, its weaknesses. (1) That fantastic 9.7" screen! Let me say up front that the screen on the Kindle DX really is great. It's got the same E ink Pearl screen as the Kindle 3, but significantly larger, and it's perfect for the PDFs that I needed to use on the Kindle. (2) More text before turning the page. Reading is also better overall because more text fits on one page. I don't know about you, but somehow this allows me to "absorb" content more easily, and I'm not turning pages so quickly. (3) Number keys. I like having numbers on the keyboard (accessible with an Alt button and something not available on the Kindle 3), but I have no praise for the keyboard itself (see negative #7 below). (4) Umm...what else? Let's see...there's a James Joyce screensaver not available on the Kindle 3 (I threw this one in so I'd have one more positive). Unfortunately, at the moment, I can't think of any other advantages. In fact, in moving from a Kindle 3 to a Kindle DX, I felt that I'd gone backwards in some areas. Why is this? Well, most people don't seem to realize (I certainly didn't) that the Kindle DX is a bit of a hybrid device. Let me explain: the Kindle DX Graphite was released only a few weeks before the Kindle 3 in the summer of 2010. 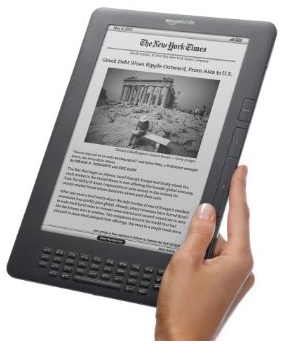 It was the first Kindle to take advantage of the E ink Pearl screen, which is also a feature of the Kindle 3. I've seen the current Kindle DX referred to as a "third generation Kindle DX" and yet, I didn't realize (and I bet a lot of other folks don't realize either) that the current Kindle DX is still running Kindle 2 software (2.5.8). This has a number of implications. (1) What? No page numbers? Since the Kindle DX is running Kindle 2 software, it has never received the page number update like the Kindle 3 and most Kindle apps. This seems very ironic considering the Kindle DX is usually the Kindle model recommended for academic use, especially with textbooks. I can understand Amazon not updating older Kindles to the newest software (although I'm certain that users of the older Kindles wish they would), but I cannot understand why a model currently being sold would not have the page number update. Even the Kindle app on my iPad has page numbers now. Why would Amazon update the software for another company's device (i.e. the iPad) and not their own? Where's the logic in that? (2) A neglected "last year's" OS. Related to the above issue is the fact that from what I can tell from published reviews with the current DX was released, while the Kindle 3 software has received continues upgrades and added features since its release, the current OS of the Kindle DX is the essentially the same OS it shipped with it last July. My DX came with software versioned at 2.5.5, which is the same OS mentioned in reviews when the DX was first released almost a year ago. I did find out that there's a 2.5.8 update that fixes a few bugs and supposedly made it turn pages faster. But I had to discover this and install it on my on. Why wouldn't Amazon ship the DX with 2.5.8 installed Other than this minor bug fix, why would Amazon completely halt development of the software on this device—a device, I remind you, that is a model currently for sale? (3) No following of other readers' comments. Not having the software on the Kindle DX updated means other features on the Kindle 3 are absent on the Kindle DX such as being able to follow comments of specific users (again, a wonderful feature for academic use in which an instructor can add notes to a book and let students follow them in their book). (4) A substandard web browser. The web browser on the DX is a much less capable than the Kindle 3 browser. The Kindle DX uses this browser to tie the user's Facebook and Twitter accounts (for social sharing), but it was a pain to set up because of all the error messages I kept receiving in which it kept giving me messages that it couldn't download certain file types. I wasn't trying to download anything; I just wanted to connect to Twitter and Facebook. For what it's worth, I had no trouble setting these up on the Kindle 3 a few weeks earlier. (5) No Audible books. The Kindle DX will not download and play Audible books like the Kindle 3 will. I realize that this might be a limitation due to the Kindle DX only having 3G service and not WiFi, but why not list Audible books in the archive anyway (as is on the Kindle 3) and allow them to be downloaded to a computer and transferred over manually? (6) No-frills PDFs. 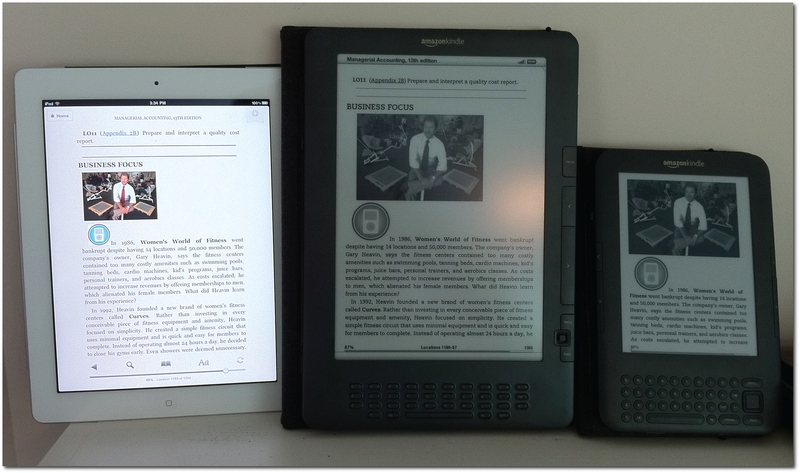 PDF functionality on the DX is much more limited than on the Kindle 3. For instance you cannot add your own annotations or highlights to a PDF on the DX, while you can on a Kindle 3. Again, for the device most often recommended for academic use, this, too, makes no sense. (7) A keyboard that is difficult to use. The only good feature of the DX keyboard is the easier access to numbers on the external keyboard. However, other than this, going from the Kindle 3 keyboard to the Kindle DX is really taking a step backwards. Of course even the keyboard on the Kindle 3 is not stellar, but I found that it's at least usable for quick notes once I got the hang of it. The round buttons on the Kindle 3 stand out, and I found I could run my fingers over them and quickly find the exact letter I needed. The Kindle DX keyboard has odd little horizontally oval keys, and the biggest problem is that the lettering on the keys is very difficult to see. It nearly blends in with the keys themselves, and unless I'm in really bright light, it's very difficult to see the label on the key I'm pressing. I never minded adding notes on the Kindle 3, but it was a a real pain on the Kindle DX. (8) Battery life doesn't compare to the Kindle 3. Battery life is much shorter on the Kindle DX than on the Kindle 3. My greatest challenge in charging the Kindle 3 was locating the power cord because I rarely ever had to use it. I immediately charged my battery when I opened my Kindle DX until the light turned green. That was on a Saturday around noon. By Monday noon (approximately 48 hours later), it was completely dead. Now, it may be that I have a bad battery. Or it may be that in re-downloading my library, that temporarily heavy use of 3G radio really taxed the battery. Perhaps DX users turn off the 3G when they don't absolutely need it. However, I always left the Wifi on with the Kindle 3. I like my books to automatically sync locations with Amazon's servers, in case I need to switch temporarily to the Kindle app on my iPad. Turning the Kindle 3G signal off all the time would prevent this from happening automatically. (9) What? I need new headphones? Since having my Kindle 3, I love letting it read to me while I drive. I've always used my headphones that came with my iPhone for this purpose and it worked fine on the Kindle 3. I tried using the same headphones on the Kindle DX, but it would not give me stereo unless I pressed in on the pause trigger on the headphone cord. And then, not only did I get stereo, but the volume seemed to triple. Obviously, I can't drive down the road holding in on on the button of my headphones to get quality sound. And before you say it, I realize that the iPhone headphones are different than normal headphones with their volume and pause/play controls, but they worked just fine on the Kindle 3 (for listening only—the buttons on the headphones obviously don't work on the Kindle). I also realize that the iPhone headphones aren't all that great as far as headphones go, but all I ever use them for is to listen to podcasts or the text-to-speech feature that worked fine on the Kindle 3. I don't want to have to buy a second set of headphones and keep up with two separate sets. Negatives 1-6 could all be solved RIGHT NOW by a software update. I really find it hard to believe that the internal hardware of the Kindle DX is not capable of handling these extra features present in the Kindle 3. Again, this is a currently shipping Kindle, not a previous model. But it seems as if Amazon began shipping the DX and then quit any further development or refining the software for it at all. 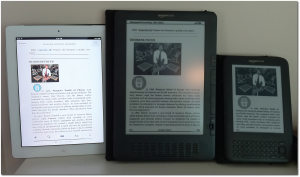 My main criticisms relate to lack of page numbers and PDF annotation, which are both present on the Kindle 3. If these aren't a big deal to you, and you need a larger screen, the Kindle DX is probably just right. One other issue they don't tell you if you're moving from one Kindle to another: I could only transfer over six issues of my current Time Magazine subscription. I've marked every issue "Keep" on my Kindle 3 as I've received them (which is inanely required if you actually want to keep them), including an issue of Time I bought before I subscribed and two individual New Yorker issues that I bought without a subscription. But nothing beyond the last six issues of Time would transfer either from my archives or from "Manage Your Kindle" at the Amazon website. I moved the missing issues from my Kindle 3 to my computer, hoping to transfer them to my DX that way, but when I tried to open them on the DX, I got a message stating that I was not the original purchaser of these issues—something clearly not true. This makes no sense either. If I had a stack of physical magazines at my house and decided to move to a new house, I could take them with me. Why can I not take electronic issues of magazines that I paid for myself? I realize this doesn't relate specifically to the DX (I don't think), but if you're moving from one Kindle to another Kindle, keep this in mind. So my Kindle DX review BOTTOM LINE: a fantastic screen, but hampered by a dated OS with a reduced feature set and lousy keyboard compared to the Kindle 3. If you've used a DX, I'd be interested in hearing about your experience in the comments. Thanks for this review! I eyed the Kindle DX for some time precisely for the ease of reading .pdfs, but I never took the plunge. Last summer, my Kindle 2 fell off my lap while I was getting out of the car, and even though it was in the Kindle case and only dropped about 2 feet, the screen was ruined in the mishap. I I left the Kindle behind (irritated at the lack of a touchscreen, the lack of capability to read library books, the tether to Amazon sales, and the lack of durability) and bought a Sony Reader. It has touchscreen capability and addresses my other reasons for disliking the Kindle. Mary, are you referring to the Sony Daily Edition? I haven't seen one, but it's got a 7" screen, I believe, which would only be a half inch in each corner over the Kindle's 6" screen. There's simply no perfect solution here yet, outside of an iPad, but as I've described, I need a second screen for when my iPad is connected to a projector. It's a shame that the DX has not been updated. PDFs actually looked great on it, but the older OS simply didn't allow for any highlighting or annotation, which is a must. Yes, I agree -- the Kindle 3 is some sort of sweet spot device right now. The small size is an advantage as far as I'm concerned. By the way, on rereading your comments, I'm not sure that problems (1)-(6) could be so easily solved by a new OS, because the DX uses a Freescale MX31 and the Kindle3 uses a Freescale MX353. I don't think the DX has enough computational horsepower to support many of the functions you request. That may very well be and may explain why the DX hasn't been updated to 3.x. Unfortunately, there's nothing on Amazon's page for the DX that lets the buyer know about these limitations. Even the chart comparing various Kindle models implies that these devices are essentially the same feature for feature with only minor variations, but this is obviously not true. Using headphones while driving or bicycling decreases your situational awareness and leads to accidents. In some states, it is even illegal. The headphones block external sound that might alert you to an impending accident. Some alternatives in your car are to use a small stand-alone speaker or auxiliary input to your car's speakers. All I ever listen to is spoken dialogue, which I assure you is more quiet than the average teenager playing music full blast. I also use the headphones--technically earbuds--for handsfree driving with my iPhone. How could I be any more safe? I don't understand why you believe the DX is not compatible with Audible books? It is, you just have to download them to your computer first, then use the USB to load them. Even with the K3 you need the wifi connected to wirelessly download. Hi, I am online trying to find solutions. I paid 375 for my kindle dx, plus a special cover, it was a huge investment for me. I did not realize there were no page numbers, it is not possible to navigate the book, it is extremely challenging to make notations, the pages turn sllllllooooowwwwwllly, it is hard to click the button all the way down, it is a challenge to type on the funky keys, and oh I could go on. I am really disappointed. I NEED the size of the screen and the e-ink. I have eye problems (eye inflammation and dry eyes, the backlit screen on my computer right now is causing burning and strain), and of course I can't see tiny print. I am just really sad about my dx, all I can really actually use it for is downloading a beach read that I never plan to read again or make notations on. For that, I guess it can be my go to airport device. But I simply can't "actually" use it for the needs that I have. I am an author, and an academic, and I often note pages and re-read things. It just simply is a huge disappointment. But I really don't know anything about "the guts" of computers at all, so I really had no way to really research what I probably should have researched.